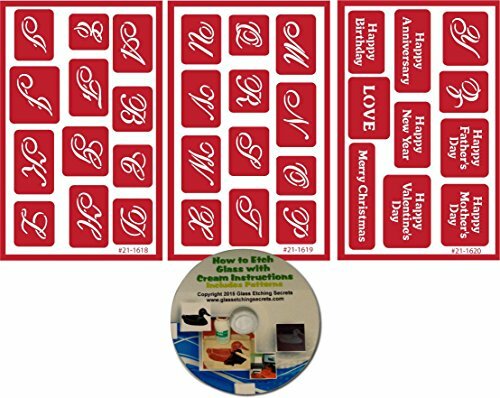 This bundle includes 4 items: 3 sheets of Script Alpha reusable glass etching stencils under brand name Over N' Over (number 21-1621) and 1 free How to Etch CD-ROM eBook with patterns for computer use only. The 5"X8" stencil sheet contains the alphabet for monogramming and various phrases. Reusable caligraphy style alphabet script letter glass etching stencils with phrases. Includes 34 total stencils of tall script letters. Great for making monogramed glasses! Includes phrases of happy Father's day, Mother's Day, Anniversary, New Year, Valentine's Day, Birthday, Christmas and Love. These adhesive backed letter stencils reduce frustration in having to cut and adhere them. Use with glass etching cream or paint.